Big trend these days is super foods. You know that! Did you know that the smaller the plant - i.e. closer in size and time from seed germination to eating it, the more concentrated the nutrients? Yep, it makes sense. Each little seed has all the nutrition for the whole plant, so when we eat it as a small green, or a shoot, it is extra good for us. Extra pretty and tasty, too, these are micro greens. Orca Eats is growing radish, pea and sunflower micros and shoots. You can grow them too, if you want to, and sprinkle them on everything, pack a sandwich with the green beauties, or make a salad or stir fry, top soups and rice and pasta and everything. Usually grown in plastic plant seeding trays, it occurred to me that a shallow hotel pan is about the same size as a plastic tray, so that’s what I’m using. Clean, organic potting soil, soaked seeds are spread on the soil in the pan, kept covered for 2-3 days, then sit under lights all day, watered as necessary and enjoyed as soon as possible! They get big pretty fast! It’s only 5-6 days for radish sprouts! 7-8 days for pea sprouts and sunflower greens. I’m letting the peas get long so they are pea shoots, which are longer than micro greens. With all that effort it seems like a good thing to double the yield. I sound like a farmer, but I’m not really. I just follow instructions and have fun. You can too! This weekend the pea shoots will be on/in the Spicy Mushroom Noodle Soup. Maybe the Asian slaw, too, which is a side that comes with the potstickers. And cheesecake pudding for dessert. In a jar. Hope to see you at the farmers market on Saturday; it’s our only public day this week. April 6th is Orca Eats’ opening day for the season. The food truck will be at the Vashon Farmers Market from 10:00-2:00, later if there are still eaters and shoppers around. We have a fun menu planned, a great crew on the truck (Hi Lori and Sara! ), and are looking forward to seeing you there. Last week I was shopping for ingredients for the test kitchen, and running errands in general before the business of Season #4 starts, and I saw so many friendly people who asked “is it almost time to gear up for the season on the Orca truck?” Yes, it sure is! Thank you for asking. The big snows this year are still keeping people busy, but are a contrast to today’s sunshine and green grass. I hear lawn mowers and a chainsaw in our neighborhood — Spring growth and Winter clean up. Watering the newly planted seeds I have in (more on that another day), I marvel at how dry the ground is and ponder Spring and Summer weather. I wonder if we’re in for a dry, warm season. There is no mud in our horse pastures. No mud, in March! So, we will see you at the Market on the 6th, and the Chamber’s Health & Wellness Fair at the Vashon Center for the Arts on April 7th (10:00-2:00). Both should be loads of fun, and we’ll cross our fingers for sunshine to really rev us all up! I hope your Spring is beautiful. I am so pleased that we were one of the food vendors at the Vashon Classic Sheepdog Trials! It was a labor of love planning, prepping and serving so much food to good locals and visitors. The handlers, the dogs, spectators, vendors, the crazy weather all played a part in making it a memorable 7 days. Yes, seven: three days prepping, four days of continuous cooking and serving. 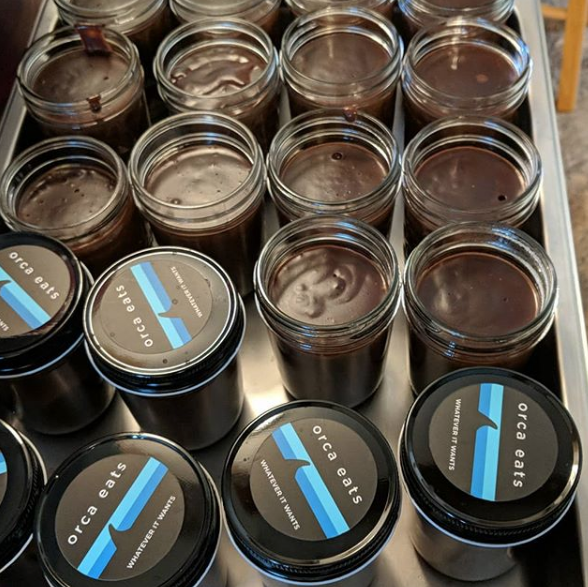 Ask me for the recipe for chocolate pudding and I can tell you in my sleep, but it'll make 24 servings and that may be a little much for most households. But maybe not! Shepherd's Pie was at the top of the menu, both beef and veggie. The beef is lovely grass-fed angus from Olsen Farms in Colville. They are a family farm specializing in beef and potatoes. That kind of says it all in terms of specialties that work well together, doesn't it? The veggie shepherd's pie was vegan, too, and the entire menu was completely gluten free. Veg shepherd's pie was chickpeas, carrots, local asparagus, onions, delightful seasonings, and topped with mashed sweet- and russet- potatoes. Really tasty! The fries! The frites! Whatever you call them, we are mighty proud of our hand-cut spuds deep fried to order until crisp on the outside and really tender and delish on the inside. Fry sauce - it's European! - and/or Orca Ketchup and a big dash of kosher salt completed the sides of fries. Chocolate pudding - yeah, so I made enough to feed the world. Not really, but 6:00 a.m. in the kitchen making pudding and pouring it into sanitized glass jars and topping with Orca Eats lids made it feel like we were serving thousands. Just hundreds, this go around! Of course" was the answer we heard time again when we asked "with whipped cream?" Who could turn down freshly whipped, as in with a whisk or a hand held mini mixer!? We did an almond milk chocolate pudding - delicious and extra chocolatey, although we don't understand the science of "why?" on that. Beverages - "medio litre" Mexican Coca-Cola (no high fructose corn syrup, just real cane sugar), truck-made ginger ale, iced tea with or without lemon and optional you-add-it sugar, and sparkling water on ice with a wedge of lemon made for refreshing wandering among the vendors, watching the dogs bring in the sheep, and maybe a little people watching on the grass, too. THANK YOU for making our weekend a blast, a success, and a big kick off for the summer season of food and fun on Vashon Island. Chef Vivian Howard is a remarkable chef in Eastern North Carolina. Her book, Deep Run Roots, is a favorite of mine for the learning, humor and phenomenal recipes. And it's beautiful. And Ms. Howard is wearing snakeskin boots on the cover. A trip to NC is in my future, I can about taste it! Ms. Howard's PBS program, A Chef's Life, airs on KCTS on Tuesdays at 3:30. The latest episode is here: http://www.achefslifeseries.com/episodes/55 Watch as Ms. Howard boards her new food truck to promote her book for nine weeks! There's a scene in which no one can get the pilot lit on the food truck oven. Boy can I relate to that moment when equipment won't start for some mysterious reason in the food truck, and the window's about to go up to serve customers! Our oven can be tough to light, and there's nothing like lying down on the floor to reach in to the base of the oven and light the propane pilot light first thing in the morning at the Vashon Farmers Market when customers will be lining up soon! Check out A Chef's Life and enjoy the process of growing, cooking and history of individual ingredients at her restaurant, The Chef & The Farmer. Since Orca Eats opened in 2016, Orca Eats has served at 9 street locations, 2 Strawberry Festivals, 6 Concerts in the Park, many VIGA Farmers Markets, catered several weddings for 80-180, events at the Lodges, a rehearsal dinner for 110 at Camp Sealth, retreats of all kinds, First Friday Gallery Cruises, Halloween, Vashon's WinterFest, events at Open Space for Arts & Community, and private homes. It has been terrific, interesting, fun, and delicious, and we are grateful for every eater who has stopped by for a bite! Oona, the food truck, is now buttoned up for winter: fresh water and gray water tanks are drained and clean, water lines drained, all the cooking equipment is clean and the truck is empty. Even the orca puppets are put away until next Spring, and we are taking a little break. But not really! A break from cooking and serving on a regular basis, but the truck is ready with full propane tanks and quick, hot menu ideas ready to serve in case of big island emergencies this winter. We will feed emergency crews and neighbors during wide power outages and any other emergency that may arise. If Vashon roads are accessible, we'll cook and serve hungry folks. It's also the time when we test recipes, tweak some favorites and dream of sunny days and serving food to islanders and visitors. We're also tuning up our Orca Ketchup for retail sales distribution! Have you read about our upcoming cookbook project with SeattleFoodTruck.com? 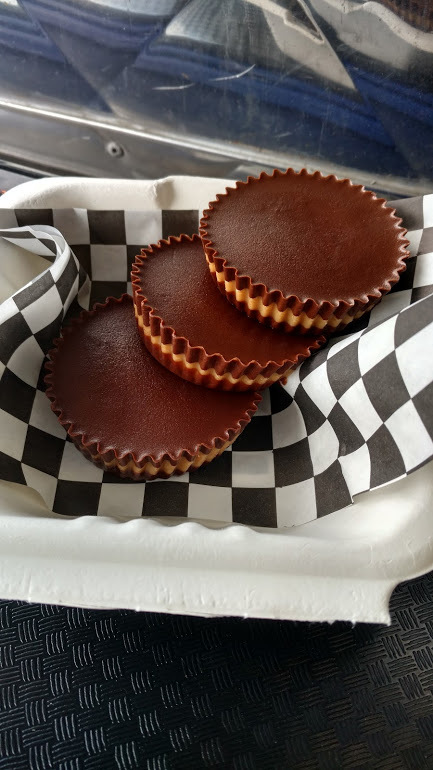 With input from a Facebook poll, we decided on two big sellers for our recipe choices: Sweet Potato Soup with Maple Cream and UFO's (chocolate peanutbutter cups). The cookbooks should be out late in 2018, and we'll have some to give away and to sell. Can hardly wait to see the recipes, photos and stories of other food truckers from the area! 2018 is just around the corner, as they say, and Orca Eats is ready to serve you and your people. We have a few weddings on the calendar, and are available for more, as well as family reunions, business meetings, nonprofit fundraisers, and more. If you are hosting a gathering, we'd love to cook for you! Let us know by calling 206-304-1049, or clicking here. It is time for these Vashon orcas to pause and say THANK YOU to you, our kind and hungry neighbors and friends. We really enjoy seeing you out the service window! See you in April if not before! We're part of a Food Truck Cookbook project with SeattleFoodTruck.com! How exciting! Two recipes, photos, text about our truck and people will be published and available. Choosing two of our menu items to be scaled to home kitchens is the first task at hand. We're taking a poll to choose the menu items. Take the poll here, we'd love to hear what you think! It's almost a given that UFO's (chocolate peanutbutter cups) will be in the cookbook, but maybe you'd rather have the recipe for Chocolate Pudding with Super Stable Whipped Cream? There will be one savory and one sweet recipe. What will they be? Let us know your choices by taking the poll! The cookbook will be available to purchase, and you know we'll do a give away or two. Stay tuned for more as the project develops! Vashon kindness story of the week . . .
A Vashon woman was ferrying home when her pickup truck starter failed and it had to be pushed off the boat. Knowing what was needed to fix it, she called Vashon Autoparts and ordered and paid for a new starter. Meanwhile an employee of US Bank saw the situation and asked if the woman needed a ride or anything else since her truck wasn't going anywhere, and was asked if she could go to the parts store and pick up the starter, which she very kindly did, delivering it to the dock. The pickup's owner installed the new starter and drove home, very grateful for the kind help of a stranger. But that's not the end . . . the owner of the pickup stopped by Orca Eats on Saturday and purchased a gift card to give the bank employee. What a nice gift of thanks to a selfless, helpful person! Gluten Free, Vegan, Vegetarian, Paleo, Dairy Free, Nut Allergies, etc. Gluten Free: yes, usually there is a GF item or two or three or an option to make it GF on the menu. We don't serve gluten free bread and buns. Why? Because we haven't found any that are worth eating! Yes, there are great GF bread and buns of all shapes and sizes, but only at retail (high) prices, and that doesn't work for our little business! There is a woman in our community who seems very nice. But ... we call her the Angry Vegan because she has come to Orca Eats three or four times and yelled at us about not having any vegan food that she likes! We explain as politely as possible what the vegan options are, and we ask what she would like to eat, and she only wants tofu sandwiches. We don't have tofu sandwiches on the menu. Tofu is wonderful. Sandwiches are wonderful. But I haven't had a wonderful sandwich with tofu in it, and I don't think one will be popping up on our menu any time soon. Sorry, Angry Vegan. And yes, I always suggest she go to Pure, the vegan raw foods cafe on Bank Road, or Anu Rana's on Vashon Highway in town. She snarls at me when I make the suggestions. Poor dear; she is so angry! Vegetarian: yes, there is almost always a vegetarian option. That's easy. Paleo: people don't request paleo, but sometimes I see the wheels turning in their heads and say "what can I help you with?" and it comes out that they eat paleo. They usually end up eating GF, as that meshes well, skip the dairy. Dairy Free: yep, most of the time! We have two extended family people who are DF, so we get this one too. Vegan is DF, so that's always an option if the nonvegan item(s) are dairyfull. Nut Allergies: Oh my! We had a near miss last year when a customer ordered her food without nuts and the message didn't get through to the staffer serving the food. Fortunately, she saw the nuts. We felt bad. We made it up to her. She comes by almost every week for a bite. We love her and her cat, who comes along, too. •There's the nice woman who can't eat bell peppers. •The man who eats no nightshades (peppers, potatoes, eggplants). •The woman who always wants to know what the sweetener is in the desserts (sugar or honey most of the time). •The family who goes happily nuts when we have sweet potato soup on the menu because they can all eat it! •Onion-guy is tough, because lots of good tasting food includes onions in the earliest cooking stages, so they can't be pulled out. But he's so nice! •The customer who only wants a light, fresh salad because she's just come from her yoga class and doesn't want anything heavy. No problem! Because our food is real and made from scratch, we know what's in each recipe; just ask! We get it! Just let us know how we can help you to eat whatever works best for you. We try, although we can't always accommodate. Emily, pondering special orders and recipes.